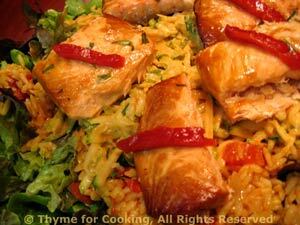 Roast Salmon Salad with Spanish Rice and Pimiento Dressing. Mix with salt, oil and spread on the salmon. Bake at 400F 200C) for 15 minutes, or until done. Remove and set aside. Could also be done on the barbecue grill for about 10 minutes. If done earlier in the day, refrigerate until ready to use. Reserve 1 tbs pimento for garnish. Put the rest of the pimento and the yogurt into a blender and purée. Shred zucchini using large holes of a box grater - no need to peel. Put it into a bowl, add 2 tbs of dressing and toss well to combine. Prepare lettuce, tear and arrange in a flat salad bowl or on a large platter. Fluff the rice and spread out over the lettuce. Cut the salmon into 4 nice pieces and arrange on zucchini. Drizzle salmon with a bit of dressing and garnish with reserved pimento.